Miss Dream » Blog » Animedia 1993 and Animage 1993 Magazines! PLUS, Super Live in NYC! Animedia 1993 and Animage 1993 Magazines! PLUS, Super Live in NYC! 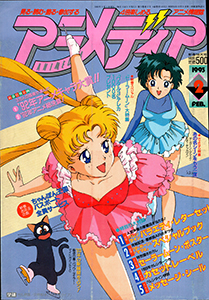 This week we bring you two magazines featuring Sailor Moon! Animedia and Aminage both from 1993! Also, new information about Sailor Moon Super Live coming to the US!! Super Live in the US gets another city stop! Excited to hear Super Live coming to NYC & DC? Thinking about going there, or waiting to see if they make more stops around the country? Let us know! Our garage sale is still ongoing, with recent additions of our DVDs and Blu-Rays, more doujinshi and art books, as well as buy one get two free on all doujinshi and magazines! Check it out for some awesome content! They may sell faster than you think!